The global polyester staple fiber market is competitive in nature and is projected to witness a significant rise in the level of competition in the next few years, states a new market research study by Transparency Market Research. Some of the key players operating in the polyester staple fiber market across the globe are Toray Industries Inc., China Petroleum & Chemical Corporation, W. Barnet GmbH & Co. KG, Indorama Ventures Public Company Limited, Reliance Industries Limited, , and Alpek S.A.B. de C.V. These players are competing against each other in terms of product quality, credit terms, and price of the product. The key players in the market are focusing on development of new strategies in order to retain their leading position in the polyester staple fiber market across the globe. In addition to this, innovations and developments in the market are estimated to encourage the overall growth of the market in the coming few years. 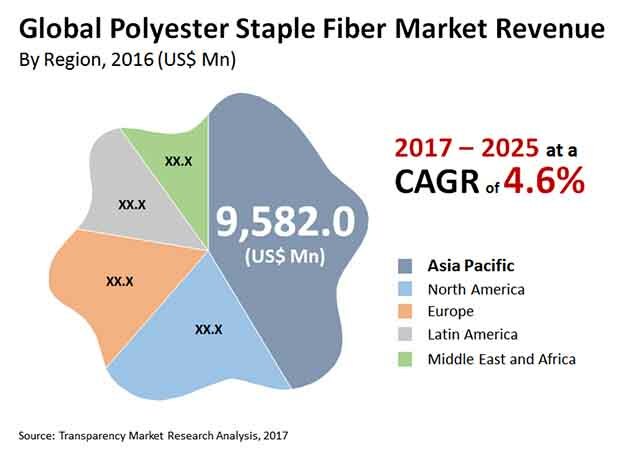 According to the market research study by Transparency Market Research, in 2016, the global market for polyester staple fiber market was worth US$23.167 bn and is predicted to reach a value of US$34.546 bn by the end of 2025. The market is anticipated to register a promising 4.10% CAGR between 2017 and 2025. The global market for polyester staple fiber market has been classified on the basis of geography into the Middle East and Africa, Asia Pacific, North America, Latin America, and Europe. Among the mentioned segments, Asia Pacific is expected to lead the global market throughout the forecast period. As per the research report, Asia Pacific accounted for a large share of the market in the last few years and is predicted to be in the similar position throughout the forecast period. The high growth of this region can be attributed to the rising commercial and residential constructions and the increasing disposable income of consumers are estimated to encourage the growth of the Asia Pacific market in the coming years. In addition to this, the high rate of urbanization is considered as another major factor, which is likely to accelerate the growth of the market in the near future. The global market for polyester staple fiber has been categorized on the basis of end use into home furnishing, personal care and hygiene, apparel, automotive, filtration, personal care and hygiene, and construction. Among these, the apparel segment is estimated to account for a major share of the global market in the coming years. The high demand for polyester staple fiber for the manufacturing of different type of apparel is one of the key factors estimated to encourage the growth of this segment. Furthermore, the home furnishing and automotive segments are expected to witness substantial growth across the forecast period. The growing demand for man-made fiber from diverse sectors is one of the key factors estimated to encourage the growth of the global polyester staple fiber market in the next few years. The high development of the apparel industry and the tremendously rising demand for personal care products are some of the key factors that are estimated to accelerate the growth of the global market throughout the forecast period. In addition, the rising construction activities in several developing nations across the globe is predicted to generate promising growth opportunities for the market players in the next few years. Leading players in the global polyester staple fiber market to focus on development of new product to ensure market sustainability. Development of construction and apparel industries to generate potential opportunities for the market players in the global market.